One of my good repeat cake orderers, S, got me to make her sissy a Totoro themed cake. We at first settled on the usual round cake with Totoros as toppers, but, just as i was about to start on the cake, i realized that it was time for a change and suggested to S if we could do a sculpted Tototro cake. 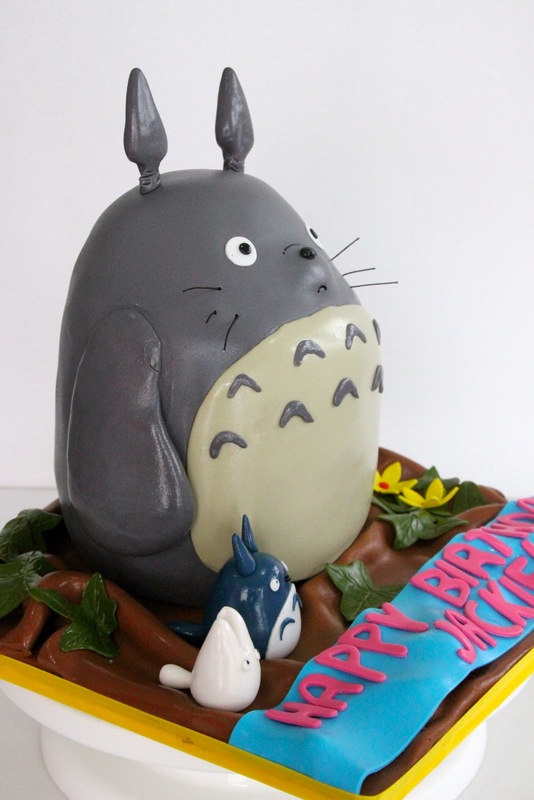 So, you would think that a Totoro sculpted cake would be easy peasy. But, looks can be deceiving. We carved Totoro out as an egg-ed shape creature at first, but quickly realized that he might eventually end up looking like a shapeless blob of nothing. So i had to add on a couple of fondant accents here and there for his nose and big fat furry chest. Cake was red velvet with salted caramel.